Bought these paint your own cars for a birthday party favor. The kids were so excited to get them-their eyes just lit up. Both the boys and girls were excited to paint them. We were told this was the best party favor people had every received for their kids! I got these to go with my kids wooden train set and they love them! I'm using this as a favor for my boys' transportation-themed birthday party. I also got sticker tags from Beau-Coup that say 'Thanks for coming to our party' and stuck them on each package. It saves me the trouble of trying to run myself ragged putting together traditional goody bags. And it lets kids be creative instead of ingesting candy! I ordered this favor for my son's second birthday and they were a big hit. Ready, set—go! 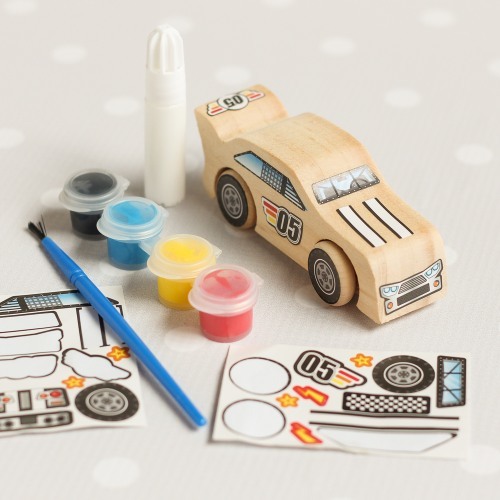 Your little speed racer will love our decorate-your-own race car party favor. Ideal for a boy's birthday party or any time it's playtime. Each kit comes with a plain block of wood shaped like a race car, four wheels, four paint pots, paintbrush, glue, stickers and easy-to-follow directions. Packaged, each car favor measures 7.25"L x 5.75"W x 1.38"D. Kit contains small parts; recommended for ages four and up. Our mini gumball machines and birthday numbers rice krispy treats are also among our most popular boy's birthday party favors.